Photo by Al Jazeera English  and used under a creative commons license . In India movie stars and filmmakers wield enormous influence and that point was drawn dramatically by Danny Boyle in the movie Slumdog Millionaire  (hint: it is the toilet scene). Interestingly, the entertainment industry's (especially Bollywood or the Hindi film industry based in Mumbai) involvement in Indian politics was pretty marginal with a few a actors and some film makers participating in the election campaign process. But, there was an exception. The Southern state of Tamil Nadu , which is the first state in the world to effectively harness and use the film medium for political purposes right from the 1940s. During the late 1960s this nexus between politicians and the Tamil film industry reaped handsome dividends for Dravida Munnetra Kazhagam (DMK)  and led to the formation of the first non-Congress government in the state. Since then various offshoots of DMK party have alternately been in power in Tamil Nadu. By the 1980s there was a steady trickle of entertainers into the political arena. In some cases they successfully contested and formed governments (like NTR and his Telugu Desam Party in Andhra Pradesh) or were voted/nominated to the Indian Parliament. 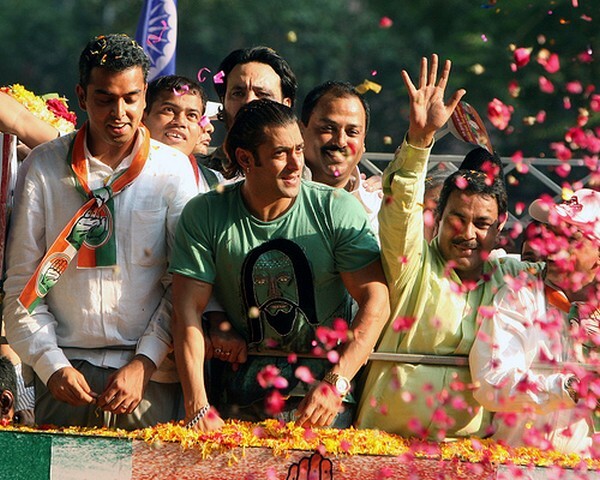 Fast forward to 2009 and the involvement of entertainers from Bollywood  (or the Hindi film industry) based in Mumbai and the Tamil and Telugu film industry have registered a significant spike in the election campaign. Telugu actor Chiranjeevi launched a new political party in Andhra Pradesh, while Bollywood actor Sanjay Dutt failed to get nominated  because of his criminal record in the 1993 Mumbai blast. In Tamil Nadu former actress and Chief Minister Jayalalitha is in the running after being defeated in the previous elections. But, it is the involvement of Bollywood folks that has captured peoples’ imagination. “The ads have been made by the actor’s production company, Aamir Khan Productions, free of cost. An ‘A’ list Bollywood ensemble has put together this campaign. The creative head is Prasoon Joshi  of McCann Erickson , Rakyesh Mehra  is the director, Avinash Gowarikar  the still photographer, and Shashi Sinha of Lodestar Media the media planner for the campaign. Everybody is working for the campaign gratis.